These sweet treats are not quite as wicked as they sound. They contain oatmeal and dried fruit so that makes them practically breakfast. The recommended dosage for mood enhancement is two, with decent coffee. Cranberries: "We're not just for Christmas you know!" First place the rolled oats and baking powder in a food processor and blitz until you have a smooth ‘flour’. In a separate bowl, cream together the butter, peanut butter, cream cheese and sugar, beating the mixture until light and fluffy. Add the egg and vanilla extract and beat until well combined. Then mix in the oatmeal ‘flour’. Finally, stir in the chopped white chocolate and cranberries. Mix until just combined. Transfer the mixture into the prepared cake tin and bake for 30 minutes until evenly golden brown. Remove from the oven and leave to cool slightly. 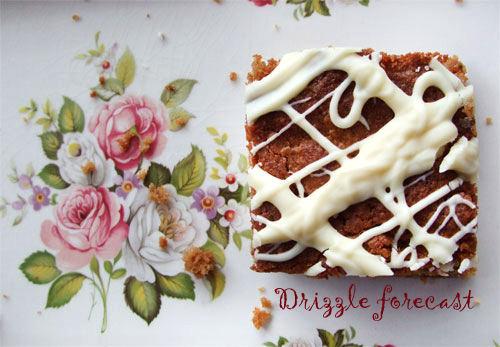 Melt the remaining white chocolate and drizzle over or simply leave to cool in the tin before dusting with icing sugar and cutting into squares. These are good slightly warm but even better if left go completely cold, so that the chocolate solidifies back into chunks. They’ll keep for up to a week (yeah right!) if sealed in an airtight container or cling wrap. My lazy woman’s way to melt chocolate: snap the chocolate into squares and place in a Ziploc bag. Remove as much air as possible from the bag and seal. Half-fill a 1 pint measuring jug with boiling water, then carefully place the sealed bag in the water making sure the chocolate is submerged. Leave for a couple of minutes until the chocolate has melted. Remove the bag from the water and pat dry. Snip off a small corner of the bag and gently squeeze the liquid chocolate over the blondies. Thanks for sharing your recipe and tips, but please forgive me if I revert to dark chocolate for this one. For me, it has "mood enhancing" properties. 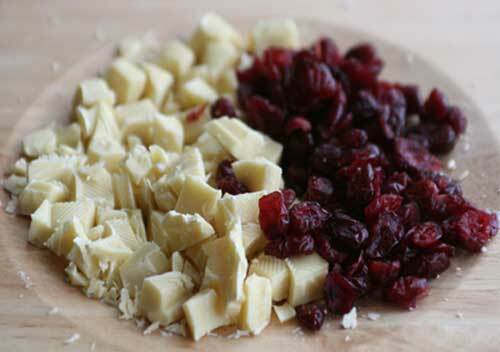 White chocolate and cranberries are an excellent combination, love the white chocolate drizzle on top too! Oh my yum! That looks so tasty. Anything with white chocolate has my vote! Oh we had the exact opposite April-record rainfall even for here in Seattle! Hope your sunshine returns soon- I'll just make these blondies and pretend it actually feels like spring around here. Lucky me, I have all ingredients in my pantry. Maybe not cranberries, but certainly some other dried fruits. Yum. Will bake this soon! Thanks. 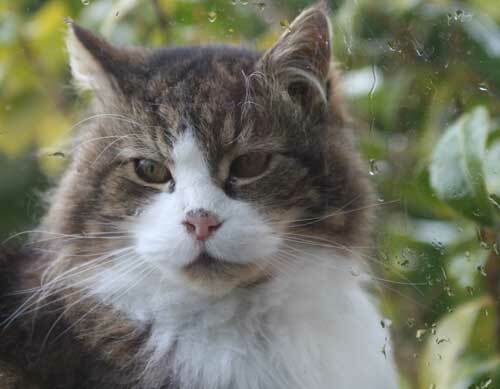 Meowsto handsome cat from mine. Yet another great treat Hester! My husband really love white chocolate (I do too, but I love ALL chocolate hehehe), so these sound like a great treat for all of us. Thanks for the tip about melting chocolate in the ziploc bag... I'll surely try it! Mmm, my mood is enhanced already! I love the idea of using cream cheese for fat in cookies; I bet it gives them a nice tang. Totally trying it out...Hope some May flowers come your way soon! Yep definitely in better humour now. I just checked and I don't even have to go out and get ingredients. Will let you know how it works out. This is one of the most delicious looking blondie recipes I have seen! 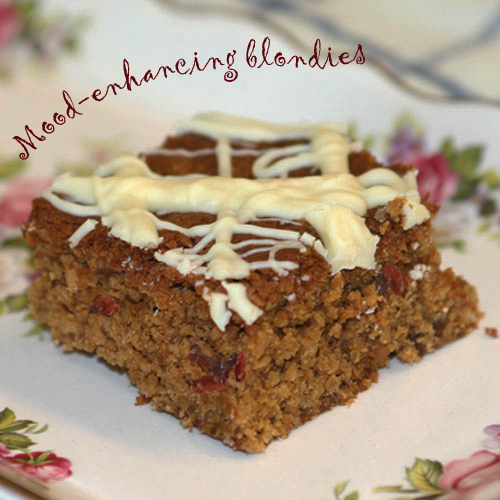 These blondies definitely sound mood enhancing! I love the way they look with the white chocolate drizzled on top. Cranberry and white chocolate is a great combination and the oatmeal definitely gives it a healthy spin. I LOVED seeing this on Top 9 today! oh those look amazing with the white chocolate! I love reading your blog!!! My favorite cookies in the world are white chocolate cranberry oatmeal cookies. This is so similar, and I love it. Having these for breakfast would brighten any day! Sounds like a winning recipe!! Hester---take a peek at my recent post--there's something there for you!!! HUGS! looks yum - a treat but healthy at the same time. Photos are so cute too! Here in Seattle we would love to have some of your good weather. Wonderful recipe. This would cheer me up! It appears that Spring is not cooperating with so many of us around the world. I too need your blondies to enhance my mood. I really thing they would start of my day nicely.